There are 39 Assisted Living Facilities in the Waterford area, with 5 in Waterford and 34 nearby. The average cost of assisted living in Waterford is $3,242 per month. This is lower than the national median of $3,346. Cheaper nearby regions include Keego Harbor with an average starting cost of $2,500. To help you with your search, browse the 127 reviews below for assisted living facilities in Waterford. On average, consumers rate assisted living in Waterford 3.9 out of 5 stars. Better rated regions include Clarkston with an average rating of 4.2 out of 5 stars. Caring.com has helped thousands of families find high-quality senior care. To speak with one of our Family Advisors about assisted living options and costs in Waterford, call (855) 863-8283. Waterford is a charter township in Southeast Michigan that covers over 30 square miles and is home to nearly 73,000 residents. Roughly 14 percent of the township's population is comprised of seniors. To support the aging population, Waterford offers five assisted living facilities. Seniors who are willing to look in the surrounding region for other options will find an additional 51 communities. In Waterford, as in all of Michigan, assisted living facilities are categorized as homes for the aged or adult foster care, depending on the minimum age of the residents that they serve. Homes for the aged primarily serve older adults over the age of 60, while adult foster care is for adults of any age. Regardless of type, assisted living facilities are licensed and regulated by the Department of Human Services. Waterford is a relatively affordable place for seniors, as its grocery costs are roughly 9 percent below the national average and its healthcare costs are about 17 percent below the U.S. average. Social Security benefits are not taxed in Michigan, and while other retirement income is taxable, there is a large deduction to offset the expense. Seniors should consult a tax expert to understand how Michigan’s income tax laws will affect them. Waterford is a relatively safe community with an overall crime rate that is significantly below the U.S. average. On a scale of 1 to 100, with 1 being the safest, the property crime rate in Waterford is 21.6, compared to the national average of 38.1, and the violent crime rate is 15.9, compared to the U.S. average of 31.1. This may provide peace of mind for seniors who are transitioning to assisted living in this community. Waterford is home to numerous arts and recreational facilities for seniors to enjoy. The Waterford Senior Center often provides supervised day trips to venues like the Waterford Performing Arts Center, where seniors can catch a live performance. The Waterford area is home to world-class medical facilities, including Henry Ford Medical Center, in the event of medical emergencies or illness. Waterford has an array of community resources for seniors, including the Golden Age Club, an organization that provides recreational and sports activities for older adults, as well as one senior center. Assisted Living costs in Waterford start around $3,242 per month on average, while the nationwide average cost of assisted living is $4,000 per month, according to the latest figures from Genworth’s Cost of Care Survey. It’s important to note that assisted living rates in Waterford and the surrounding suburbs can vary widely based on factors such as location, the level of care needed, apartment size and the types of amenities offered at each community. 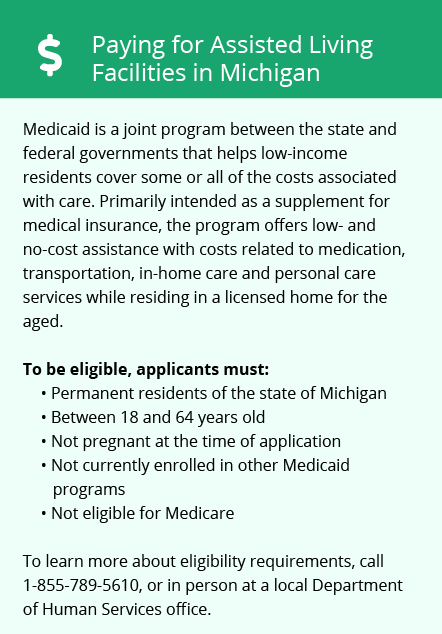 Waterford seniors who are eligible for Medicaid may use the State Plan to cover their assisted living costs. 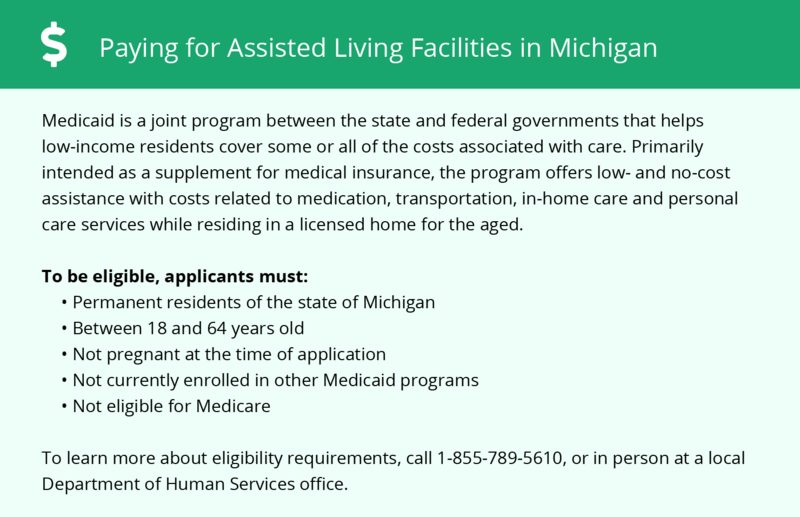 In addition to this, Michigan provides an optional state supplement to Supplemental Security Income, which can be used for assisted living expenses. Waterford and the surrounding area are home to numerous government agencies and non-profit organizations offering help for seniors searching for or currently residing in an assisted living community. These organizations can also provide assistance in a number of other eldercare services such as geriatric care management, elder law advice, estate planning, finding home care and health and wellness programs. To see a list of free assisted living resources in Waterford, please visit our Assisted Living in Michigan page. Waterford-area assisted living communities must adhere to the comprehensive set of state laws and regulations that all assisted living communities in Michigan are required to follow. Visit our Assisted Living in Michigan page for more information about these laws.